I was at the Mozilla Festival, prepping notes in an etherpad for a session I was helping to organize. I was distracted, signed in with the wrong credentials, hit the wrong button and — what?! ohmygod ohmygod ohmygod — suddenly realized I had just shared my geeky etherpad link with a potential audience of nearly 3 million (yes, million) twitter account followers. I knew something was up when a lot of people immediately showed up in that pad. Like… a lot. 20, 30, 50 folks streaming in all at once. “Strange game!” someone wrote. “What is this?!! 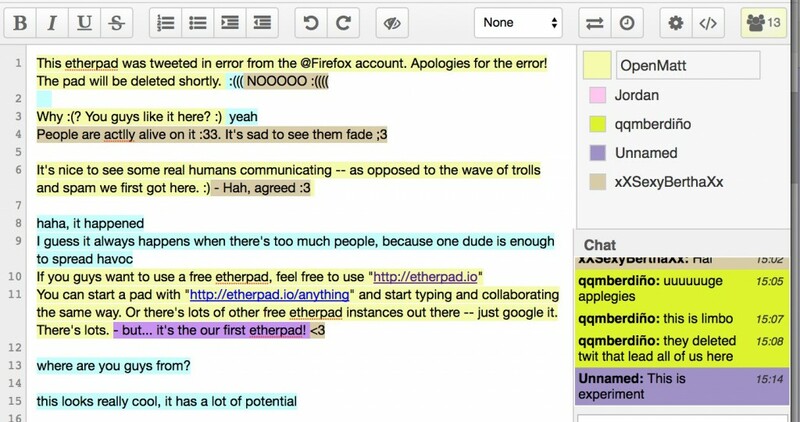 !” Most had never seen an etherpad before (if you’re not familiar, it’s a simple collaborative writing and editing tool, like Google Docs). It’s basically just a blank sheet of paper posted on the web, one that anyone can read and write on — and the twitter users who had suddenly arrived there were (understandably) confused. The pad was overflowing with random ether-noise and flotsam, with people all writing and remixing and talking over top of each other. I explained at the top of the pad that the link had been tweeted in error, and apologized for the mistake — but of course…. it’s an etherpad! People erased my message and just wrote over top of it. It filled with a cacophonous rainbow-colored torrent of ether-junk, a bubbling petrie dish of speech that pulsed and warbled and mutated all over itself. 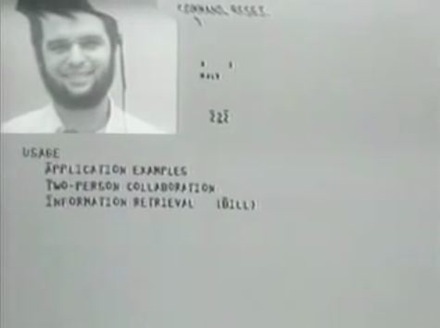 It could have been worse — there are worse things to share out than a blank etherpad. But I was, of course, freaking out. As Mozilla staff, we take pains to ensure all our users (including twitter followers) have great experiences. So: I hit the red alert button. I sent panicky notifications to colleagues, found someone with the power to delete the tweet (something I lacked the credentials to do myself), and within about 20 minutes of my mistake, it had been erased, ensuring it wouldn’t confuse any more followers — a relatively small number of whom had actually seen the tweet. My pulse slowly returned to a saner level. what to do about that etherpad? No one new was arriving, but there were still a dozen or so users splashing around in it — with various weird memes, random You Tube videos, Cyrillic script and U.S. election slogans swirling. It was strange and unpredictable in there. I wanted to ensure none of those users ended up having a negative experience, so I filed a bug with I.T. to get the pad deleted. But then, a funny thing happened: the trolls got bored and drifted away. The maelstrom of people shouting over top of each other quietened. Soon there were just a tiny handful of people left, and they started to… well… actually talk to each other. “This looks really cool, it has a lot of potential,” one of the users wrote. They’d never seen an etherpad before, and were intrigued by its open, geeky charm. A couple others started chatting about a problem they were having with their computer, offering each other advice. They were connecting. And helping each other. When I explained that the pad was going to be deleted soon, they were sad and didn’t want to leave. — Why? Do you guys like it here? Yeah. People are actually alive on it :3. It’s sad to see them fade. This lead to me explaining they were welcome to start their own pad and keep talking, or use it whenever they wanted. Which they did. In a world of increasingly managed, read-only experiences, the fact that etherpads are so wide open to anyone to just write and edit on is a beautiful encapsulation of fragile trust and care, and of the multi-vocal nature of the web (and world) itself — what my lit professor would call “polyglossia,” multiple voices sharing a space. It’s not something I plan on doing again any time soon. (Or ever, ever again. Promise.) But I came away a little grateful for the accident. It felt like a very #MozFest moment. “Jordan,” “qqmberdino” and “Bertha,” whoever, wherever you are — I hope you’re awesome, and still happily etherpadding in some corner of the web somewhere.